First open Active Directory Administrative Center. This can be done through Server Manager > Tools > Active Directory Administrative Center, or by simply typing ‘dsac’ into PowerShell. 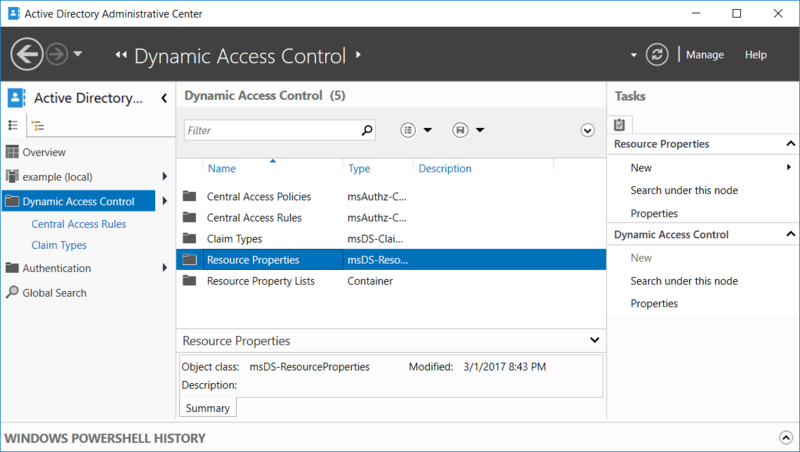 Select Dynamic Access Control from the menu on the left, followed by Resource Properties. Double click resource properties to enter it, we can see that there are many default Resource Properties already configured. These are all disabled by default, however we can enable them if needed by simply right clicking them and selecting enable. We can edit these existing resource properties or create new ones. To create a new Resource Property, select New from the menu on the right, followed by Resource Property. 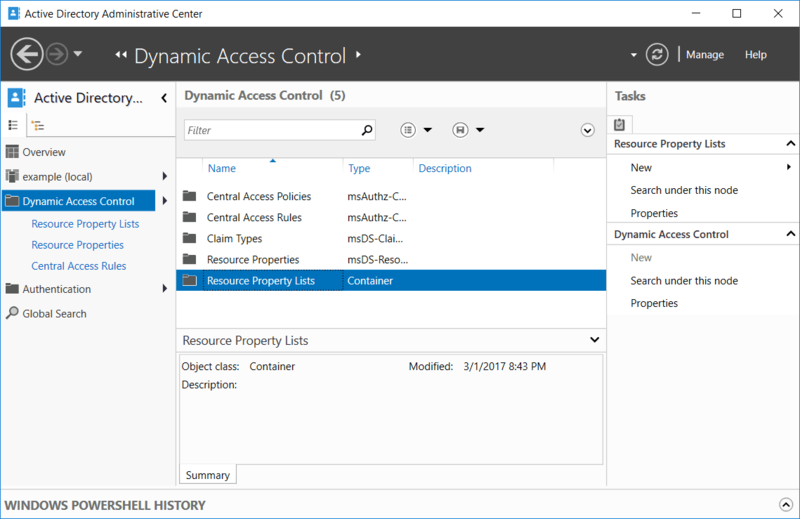 This will open the Create Resource Property window, as shown below. 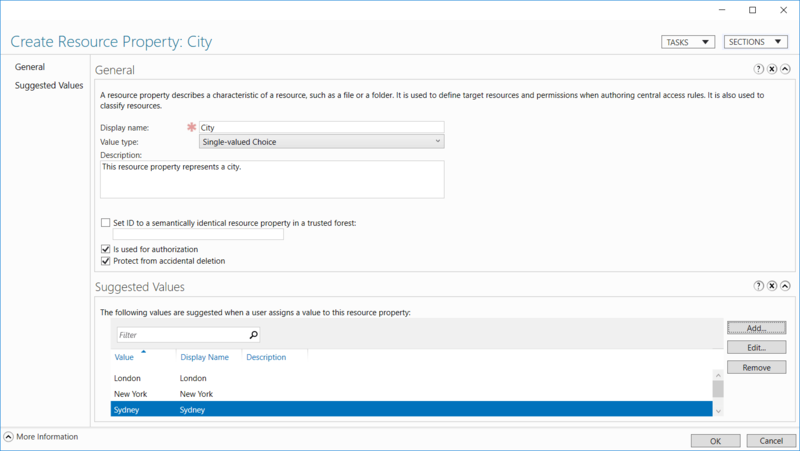 In this instance we name our resource property City and fill in an optional description. We then define some suggested values that can be used for this resource property. Our new resource property shows up in the list with all of the others. Now that we have a resource property, we can add it to a resource property list. Basically the list can contain one or more resource properties. By default the custom resource properties that we create are automatically added into the global resource property list, this is sent to all servers through group policy. We can view resource property lists by selecting Dynamic Access Control > Resource Property Lists, as shown below. After double clicking Resource Property Lists to enter it, we can select New from the menu on the right, followed by resource property list to create a new one. In this example we create a simple list called “Test List” which contains our “City” resource property that we just created. 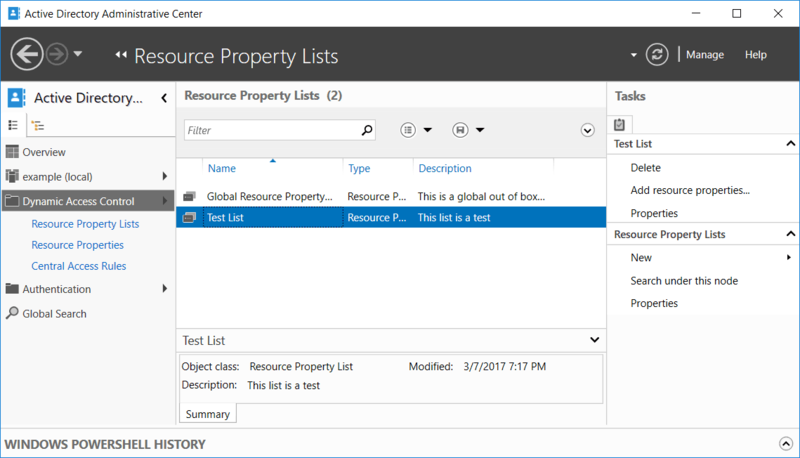 Once complete click OK to create the list, we should now see our newly created list along with the default global resource property list. Now if we run the below PowerShell cmdlet on the file server with FSRM installed, we can deploy the newly created resource property list to that file server. If we open FSRM and view Classification Management > Classification Properties, we can see the City resource property that we created is shown. The scope is listed as global as it’s coming from AD rather than the local file server. This allows us to use the resource property to classify files and folders on all file servers throughout the domain. Creating a classification property in FSRM itself only applies to the local file server. 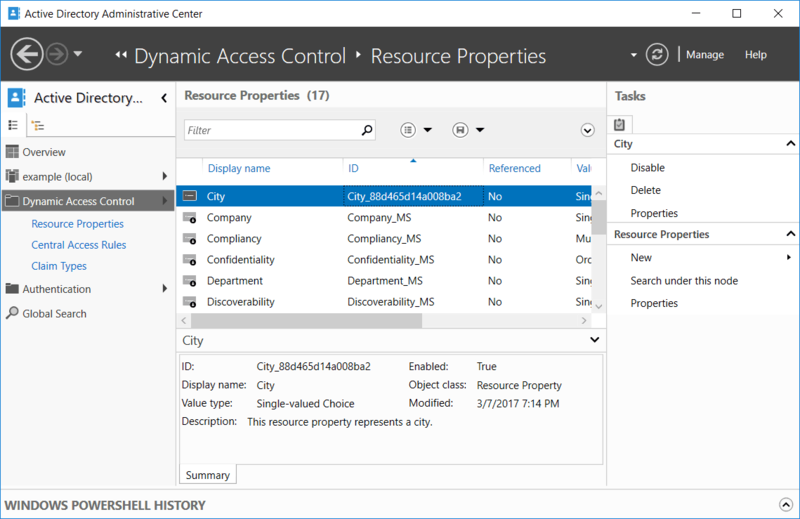 We have shown you how to create and configure resource properties and lists as part of Dynamic Access Control through Active Directory Administrative Center in Windows Server 2016. First create a resource property, then add this into a resource list which can be deployed to a file server.